What a fun year we have to look forward to. It’s hard to say what is the most exciting so we will just dive in. Do you know of any “Super” youth between the ages of 17 and 20? We want to know who they are to compete in our reinstated UTAH BEEF AMBASSADOR TEAM contest! This will be March 13th at 1:00 p.m. in conjunction with the FFA State Convention at USU in Logan. A scholarship will be offered to the top three winners. Please let Nikki Weston (chair of UBAT) know of potential contestants at 208-847-5243 or montyweston@yahoo.com. We will keep updated information on our *webpage and *facebook. Ranch History Recipe Book! Amber Johns from Nevada is compiling a cook book with ranch histories all across the nation. We want to do this for a fundraiser in 2015. So we need your recipes and histories! The information is on our webpage and our facebook page, but if you would like it mailed to you please call me 435-693-3136 and I will get it to you. Please e-mail the recipe/history/photo to: bethbanderson@hotmail.com or mail them to me: 290 Pony Express Road, Callao, UT 84083. The deadline is the end of January so HURRY! It is with great sadness that we let Francine Hallows rejoin her busy life without the cattlewomen first vice presidency duties. She will be greatly missed, but we completely understand her hectic life. Thank you Francine for the awesome plaques at convention and everything you do! We are excited to welcome ReNee McKinnon to the office of First Vice President! She is currently our Membership Chair and past Second Vice President, at which she has been great! At our annual meeting we voted to accept the changes to the Constitution and By-laws. The new Budget Committee will be: Beth Anderson, ReNee McKinnon, Diane Weston and Laurie Munns. The Nominating Committee is Nicki Wintch (chair), Leslie Yardley and Brandy Christensen. A huge THANK YOU to Jenny Adams for her service on the Audit Committee as member at large! Elected in her place is Sherry Spencer. We welcome Sharece Munns as an Area Director to Area 1. Please check out our webpage where we have all the committees and area’s listed. We send best wishes to Marcea Neilson for a speedy recovery and a huge THANK YOU for her years of service as Scholarship Chair! Marcea has been chair since the scholarship program was started in 2000 when Ruth Ann George was president. Suzi Weston will now be the chair for the Scholarship committee and Carol Johnson and Marcea will still be on the committee. Scholarship applications are due April 30, 2014. Applications can be found on our *webpage. Congratulations to Carol Fuhriman on receiving the “Spirit of the CattleWomen Award” at our banquet last month. We just love her and all she does for the CattleWomen. “Millennial” is the new buzz word. These tech savvy youth (born between 1980 - 2000) are the next generation of consumers that we need to keep up with. I guess it’s appropriate that our cattlewomen slogan is “Educating Generations for the Future”. It is amazing what the American National CattleWomen (ANCW) and the Check off program are doing to help us meet these demands. Thank you Barbara Jackson (ANCW Pres.) for coming to our annual meeting in December! I learned from the “My Beef Check-off News… that nearly half of babies in the United States have used a computer or mobile device before their second birthday”. That is amazing, and we need to keep up with this generation. We want the Millennia’s to be informed with correct facts and information for their busy lives and choose delicious BEEF to feed their families. Upcoming events that are just for you CattleWomen…and some for Cattlemen too. *March 13, 2014 Utah Beef Ambassador Team contests 1:00 p.m. at USU in Logan. *April 30, 2014 Utah CattleWomen Association Scholarship applications due. *April 30 – May 2, 2014 Region VI ANCW meetings in Lake Tahoe, hosted by California. These are great meetings to learn more about ANCW and learn many ways to help promote and educate others about beef. Not to mention the great ladies we meet. We hope to see you at these meetings! I’ve heard it said that “Those that show up rule the world”. We need your input and your support. I’m excited for this coming year and getting to meet more of you! Best wishes in all of your ranching! 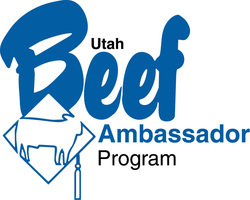 The Utah Beef Ambassador program strives to provide an opportunity for youth to educate consumers about beef, including beef nutrition, food safety, the economic value of the beef industry, and stewardship practices of the beef industry. Our goal is to find and utilize a beef ambassador team that will passionately tell and share our beef production story to consumers and youth throughout the state through promotion, education, and media. The Utah Beef Ambassador Program (UBAP) will enable the Cattlemen and Cattlewomen of Utah to connect closer in reaching the “Millennial” generation, promote safe and nutritious facts to consumers, and portray the quality of care of ranch animals. This program is essential because today’s youth are bombarded with anti-beef messages that often find their way into schools. 1st Place-$1,000; 2nd Place-$500; 3rd Place-$500. Contact Nikki Weston (UBAP Chair) 208-847-5243 or montyweston@yahoo.com for more details. Check out our website utahcattlewomen.org for more information. We want the amazing youth from our Cattlemen and Cattlewomen. We know they are out there! Contact us as soon as possible. A similar program has been held in our state prior to 2000. We hope this will be a huge success! Looking forward to your input! We are glad that we have these programs to help our youth excel and share factual information with our new generation of consumers the “Millennial’s”. We have such a high tech world that we live in! These two programs are one way to bridge that gap between those of us that were raised on black and white TV’s and one computer in a whole building, to our youth that can carry thousands of songs on a device the size of a postage stamp. Truly amazing the world we live in! We hope to see many of you at the Utah Beef Cattle Field Day at BYU on February 11, 2014~“Focus on Health”. And remember our ANCW Region VI meetings at Lake Tahoe April 30,-May 2, 2014. Contact me if you have any comments or questions. The first, second & third place winners will become our Utah Beef Ambassador Team. Team members will receive reimbursement for covered events throughout the year. Upon completion of their year, they will receive their scholarship money. The first place winner will go to the National competition in September. Check out our website utahcattlewomen.org for forms to download. We hope this will be a huge success! You can’t win if you don’t compete! This year is flying by already! I hope that the spring and calving are treating everyone great! Those that were able to attend the Cattle Industry Convention in Nashville learned a great deal and were treated to loads of information and great entertainment. The ANCW ladies adopted new by-laws and restructuring of their organization. This change will increase the need for great volunteers as we go forward in promoting and educating about wonderful BEEF! If you go to ancw.org, you can fill out a short survey and list what you would be interested in assisting with. These ladies are amazing and do a great job reaching the millennia’s, (Millennia’s are those born between 1980 and 2000, you will be hearing this term a lot!). On the home front here in Utah we have been collecting recipes and ranch histories for Amber Johns in Nevada who is compiling a National Cookbook to be ready for 2015. Thank you ladies for sending them! We are promoting the Utah Beef Ambassador contest coming up and getting ready for the upcoming Farm Field Days this Spring. I have been able to come to most of the local meetings, it’s great to put a face to the names. The membership agreement with ANCW or Wildly Important Goals Go Yahoo (WIGGY) is coming along great. We do need everyone who has had or been part of a beef educational or beef promotion event since last May, to contact your area director or cattlewomen’s board member so we can get credit on an “Activity Report” towards this contest. You don’t have to be a member of ANCW to get credit for these activities. The competition is tight and the winning state will receive a Powder River Calf Table! So with everyone’s help we can have a chance. If you don’t know who to contact, call or e-mail me, Beth at 435-693-3136 or bethbanderson@hotmail.com. The ANCW Region VI meetings hosted by California at Lake Tahoe on April 30, May 1 & 2, 2014. Information and registration forms are available at ancw.org or you can contact Beth and she will get you what you need. Remember that applications are due April 30, 2014 for the Utah CattleWomen Scholarship! Thanks for all that you great ladies do on a daily basis! You are great! Hello Utah CattleWomen, It is SPRING! We have a Utah Beef Ambassador Team! Three amazing young ladies were chosen from nine great contestants on March 13, 2014 at the first UBAP scholarship contest held in conjunction with the State FFA Convention. Leann Fox, a sophomore at Utah State won the $1,000 first place scholarship. Kamrey Olsen, from Spanish Fork won the $500 second place scholarship, and Maya Andersen, from Carbon won the $500 third place scholarship. This is going to be an exciting year with help from the ambassador team. Thank you to Nikki Weston for being an amazing chair of this committee, our fantastic judges, and the Utah Beef Council for sponsoring the Utah Beef Ambassador Program! We are not done with scholarships yet! The Utah CattleWomen scholarship deadline is April 30, 2014. These forms and information can be found on our website (utahcattlewomen.org) under the “Scholarship” tab. We will be awarding two $500 scholarships this year. If you have questions or would like an application mailed to you, please contact Beth Anderson 435-693-3136 or Suzi Weston 435-793-5635. The ANCW Region VI meetings are scheduled April 30-May 2, 2014 at South Lake Tahoe. California CattleWomen are hosting this year and have put together a great list of speakers and events. This is a great way to be involved on the national level. Information is on our website as well as ancw.org and you may call me if you need. Are you Beef Quality Assurance (BQA) certified? It is free until April 15th. Visit http://www.bi-vetmedica.com/ to complete your certification. It doesn’t take much time and can help the bottom line in your operation. This is a $25 to $50 value. UCA & UCWA Summer Convention will be just around the corner. Dust off those running or walking shoes and be ready to participate in a “BEEF for the Finish 5K Run/Walk” as our cattlewomen’s fundraiser (for ladies and gents). More details to follow. Have you heard of the new buzz word in the Millennial world? It’s “CLEAN”, clean food, clean diet, clean from antibiotics, clean from sugars, clean from this and that. Spring is here in full swing and all that goes along with it. It has been great to attend most of the county cattlemen dinners the last couple of months. We have so many great people in this state! I hope that your calving and ranching are running smoothly. We learned in Nashville that we should get some relief from the drought this year and prices should remain strong, which is great news. Hello CattleWomen, Are we having fun yet? The Utah Beef Ambassador Team (UBAT) has completed their training and their Masters in Beef Advocacy’s (MBA)! What a great team we have! 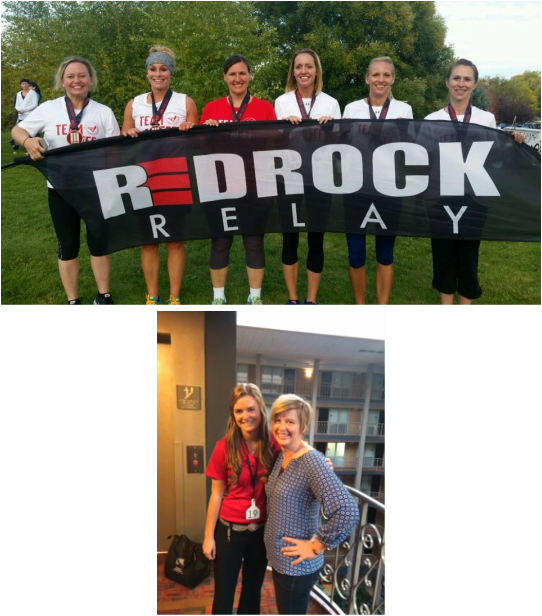 Leann Fox, Kamrey Olsen and Maya Anderson will be helping promote beef and educate consumers at Raspberry Days, Ute Stampede, Ragnar Wasatch Back Race, Sam’s Club ANCW demonstration’s, UCWA’s State Cook-off and demo’s, and giving books to elementary schools. Look for them in their bright yellow shirts with the blue logo. We hope this is the beginning of a great program! ANCW is working with the Sam’s clubs across the nation in having a spotlight on a cut of beef and a CattleWoman there with the demonstrator to answer questions for the consumers. Our own Diane Weston and ReNee McKinnon will be helping in our state at the Sam’s in Riverdale. The UBA team will also be on hand to help. The UCWA Scholarship winners will be announced in the next issue. One of the scholarships this year will be given in memory of Carol Fuhriman. What a great lady she is and will be greatly missed. We are so grateful that we were able to honor her in December. We send our love to her family. Summer Convention will be at the Yarrow Hotel in Park City July 8,9,10, 2014. The cattlewomen are excited to have a 5K run/walk race for our fundraiser event this year. What better way to communicate to our “Millennial” generation the benefits of eating beef and a healthy lifestyle. This is for the ladies and the cattlemen too! The registration fee is $15 if you are a member of UCWA or UCA, $20 for all others and $30 after Friday, June 13th. We will be asking for sponsors if anyone would like their logo on the back of the t-shirts; $50 (small) or $100 (larger). A form will be on our website utahcattlewomen.org, or we can mail one to you. Spring cleaning is helping the Executive Board of UCWA in reviewing the Constitution and By-laws. We will publish and post any corrections and typos that we have discovered in the constitution on our webpage. If you would like a copy mailed to you, please contact Diane Weston, (435) 793-5955. We hope to vote on these at the summer convention and have everything up to date. It is always a wonder as we watch the earth wake up from its winter slumber. From the sprigs of grass, to blossoms, to new calves and foals, to chicks and ducklings, babies and new life coming forth give us a renewed strength to keep going forward. On that note, congratulations to Jennie and Jeff Christensen, Nicki and Mark Wintch and Ginger & Jared Johnson on the births of their new bundles, and any other lucky parents with new arrivals. Spring truly is a blessing of new life and beginnings. Beth, Diane and I had the "golden opportunity" of attending the 2014 ANCW Region VI meeting, in South Lake Tahoe, California. The California cattlewomen planned and presented a terrific meeting. Three vintage California cattlewomen presented histories of their respective ranches. It was so interesting to see the pioneering spirit they had preserved. They all had great pride in their ranches, and what they had been able to accomplish through their hard work. It was so exciting to see the rural side of California and to realize that California is much more than the Golden Gate Bridge, Disneyland, and Sea World. Ranching has been part of their heritage for generations. We counted back and realized that our own ranches have been in our families for seven generations. What a legacy we have! Dr. Dave Daley, professor at Chico State University, talked about the changing face of animal agriculture. He touched on what the next generation will bring. He was very optimistic about the future in our industry. Karen Ross, the Secretary of Agriculture from California, spoke to us and she was a "Rock Star." She is almost as terrific as our own Secretary of Agriculture, and Utah Cattlewoman, LuAnn Adams. Secretary Ross informed us that there are 300 different career opportunities in agriculture. Thus, opportunities for young people in our great industry are unlimited. She said communication is very important. We need to connect with moms, foodies, and millennials. It is important to connect family to family, and family to the land to preserve our incredible way of life. Melanie Fowle, president elect of ANCW, challenged each of us to recruit one new member by the end of the year. In the state president report, Beth Anderson talked about our beef ambassador contest. We are really excited about working with these wonderful young ladies. They have brought a new dimension to the Utah cattlewomen. We enjoyed a dinner cruise on Lake Tahoe, and on Friday we toured the Bentley Ranch in Mindon, Neveda. This "golden opportunity" was a huge success. We met old friends and made new ones as well. We learned much about our exciting industry and its great potential for the future. It would be great if more of you can attend next year in Arizona. I hope spring work is going great for all of you. See you in Park City. We have an amazing neighbor! He has knowledge from how to hitch a team, mow and put up hay with horses, to fixing big diesel equipment and technical new vehicles. John Sims has seen a lot in his 101 years. I have never heard him complain about anyone, and he would drop everything to help anyone in need. He is the perfect example of getting up every day and being grateful for all he has, even down to the dew on his shoes in the morning. What a blessing to have his perspective in our lives. We asked him his secret and his response was "to keep getting up every morning". It is amazing to me all we can learn from these great pioneers. We all have someone in our family, community, town or state that have seen a lot in their lifetimes. The weather of the years can be seen in their faces and their eyes. Hardships and trials are talked about as blessings. What we could learn to walk in their shoes. What a great legacy we have the opportunity to follow. I think of the past presidents of the Utah Cattlewomen. This organization was started in February 1947, 67 years ago, more as a social group for the wives of the cattlemen as the Utah Cowbelles. From that social group to today with the farm field days, scholarship recipients, beef ambassadors, spirit of Cattlewomen awards, webpage, facebook and "educating generations for the future", we have made some amazing strides. One of our past presidents, Irene Holt, also served as president on the national level. She started the National Beef Cook-off contest. Jeaneen Chambers was president when we became Utah CattleWomen and started the Spirit of the CattleWomen award for great ladies in our state. Jeannie Ekkers Taylor handcrafted a large leather scrapbook. Ruth Ann George started the UCWA Scholarship program. Laurie Munns was president when the cattlemen decided to contribute money to the cattlewomen. Thank you to all of the previous 37 presidents who have served before me. These ladies are amazing and are still actively involved. With the new "Millennial" generation and instant technology at your fingertips, we are changing how we approach life. 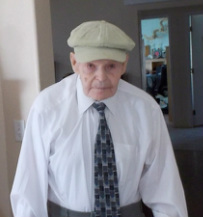 Another man I admire is my husband’s soon to be 93 year old uncle. Uncle Richard actively uses his computer and has a Facebook account! So he is living proof that you are never too old to learn new things. Twitter parties are still daunting to me, but I will brave that someday. Speaking of technology please check out our webpage: utahcattlewomen.org, our facebook page, and the new blog for the beef ambassadors: utahbeefambassadors.blogspot.com. We hope to see you at our UCA/UCWA summer convention in Park City! It is one family reunion you won't want to miss! I say family reunion, because our cattle family is fantastic! There are no better people in the state! We also hope you will come and run or walk with us July 9, 2014 at 7:00 am for our Beef 4 the Finish 5K. I hope the summer is treating you well. Hay growing great, calves healthy, kids amazing, and equipment running smoothly! 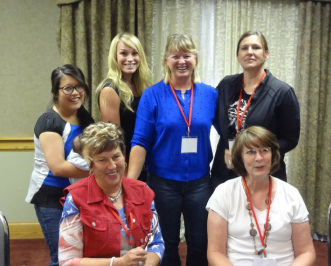 A few weeks ago in July, the Utah Cattlemen and CattleWomen Associations gathered once more for the 2014 summer convention held this year at the Yarrow Hotel and Conference Center in beautiful Park City. It was another successful and educational event. Attendees were able to hear updates and issues from around the state at the general membership meeting. We heard from very informative speakers LuAnn Adams, the new Utah State Commissioner of Agriculture and Food and Representative Ken Ivory, who serves on the American Lands Council. The evening ended with a delightful ice cream social and entertainment provided by some of our very talented association members. Thanks to all those who attended and especially to those who worked so diligently to put the event together. At the CattleWomen’s meeting, we were able to meet this year’s scholarship winners. We couldn’t be more pleased with their accomplishments and are excited for their futures. UCWA 1st Vice President ReNee McKinnon reported on the success of the beef demonstrations in partnership with Sam’s Club stores across the nation and American National CattleWomen, to showpiece a cut of beef and provide samples in order to draw in and educate consumers. The store in Riverdale, Utah was selected and had its first demo in June. It will continue to showcase beef throughout the summer with our own CattleWomen and Utah Beef Ambassadors there to staff the booth and promote beef and answer any questions. Sales of beef at the Riverdale Sam’s Club have already increased due to the demos! Lastly, don’t forget to look for us and support beef during the Utah State Fair in September, on the 12th for the Beef Feast and the 13th for the State Cook-off contest and demonstrations. Also the Utah Ag Products BBQ in Logan October 11th. See you there and enjoy summer! Convention attendees enjoy an evening social with games, skit "Heard in the Herd" and ice cream. Convention attendees participate in the ranch and area tour around Coalville. 1. I’m not asking you to do anything that I haven’t already done. On August 13 I submitted my comments to the EPA and Army Corp of Engineers on their supposed clarifications (Clean Water Act) of the WOTUS (Waters of the United States). Kristina Butts and her staff have made this VERY SIMPLE for everyone to submit comments. Please log-on to www.beefUSA.org. Click on "Waters of the U.S.", then "Tell the EPA to Ditch the Rule" and "Submit Comments Now". This will lead you to fill out your name and address, when you select “submit” at the bottom it will take you to a form letter. You may submit that letter, or you can add your own story and personalize it. This is strictly a numbers game, we need YOU, your husband, your children, your grandchildren, we need EVERYONE to go to your computer and submit comments. Comments may also be mailed. Don’t wait for someone else to do this! It is up to each and every Cattleman and CattleWoman to DO IT NOW! The Professional Golfers Association (PGA) has also joined in our fight. The Texas Wildlife Group is the only sports group (hook & bullet) that has joined the fight. If you belong to a sports group, make them aware of the dangers of this act. If you are hunting or fishing and knock some dirt into the stream or pond, you could be facing a fine under this new act. It is time now to stand up and be counted! IT IS VERY IMPORTANT THAT EVERYONE SUBMIT COMMENTS! I cannot stress enough how important this is. Better yet, write your comments in a word document and send it to all of your state representatives as well. There is a link on this site also that will give you the e-mails of all the elected personnel in our state. Kristina also told us, "It's not important for you to know your representative, it's important for them to know you". 2. We are striving to have an “e-mail tree”, on a state level, so we can contact you of legislative issues as they come up. If you would like to receive alerts, please get me your e-mail at bethbanderson@hotmail.com. We need to stand up. I was disappointed in the “pro” responses to the BLM on the recent wild horse gather, we can do better than the “other” groups! Yes, we as CattleWomen are aware of the issues. 3. We have made some changes to clean up our constitution and by-laws, please visit our webpage to view those. (www.utahcattlewomen.org) If you want them mailed to you, please contact Beth at 435-693-3136. These will be voted on at our Annual membership meeting in December. We have great things planned for this meeting, you won’t want to miss it! On the bright side, we hope to see you at our State Beef Cook-off on September 13th at the State Fair Park. "Fall Favorites" is the theme. Nicki Wintch is the chair and does a great job! Our Utah Beef Ambassador Team (UBA) of Leann Fox, Kamrey Olsen and Maya Anderson will be there to help also! We are excited for Leann to compete at the national Beef ambassador contests this month in Denver. Nikki Weston is a great chair of our UBA. Our very own Utah CattleWomen Team Beef will be participating in their first race in Park city in October. Deb Richards is heading up the team, with Jodi Reeder helping. Go Utah CattleWomen! Trisha Downing was the keynote speaker at summer conference in Denver. As she was aspiring to be a professional cyclist, an accident paralyzed her from the chest down. She said, "In life we don't do our accomplishments alone. It's a team effort." One of her therapists taught her this mantra, "Work hard, do a little more each day, stay patient and don't give up." All of us have an inner champion within us, we need to find our inner strength and get into the race, the human race. She has competed in the Ironman competition in Hawaii, and shared her successes with us. What an inspiration she is! The nights are cooling off a little bit more each evening, for some of you your children are back into school and all of the activities that flow with education. September for me seems a bitter sweet time. Fall is coming on, summer has ended way too soon, calves will soon be weaned, the last crops will be harvested. I'm hoping for at least enough from the garden to can something before it freezes. A long Indian Summer would be nice. I feel like I have been running behind ever since it thawed in March! I hope each of you will submit your comments TODAY to the EPA! As we “Educate Generations for the Future” remember: "Work hard, do a little more each day, stay patient, don't give up", and Keep Smilin’! It's my favorite time of year again. The nights are cooler, the days are starting to get shorter and harvest season is coming to an end. What a great year it has turned out to be for agriculture. We have been counting our blessings this summer with the wonderful amounts of moisture our state has received. Hay may have been on the ground a few days longer than expected and grain may have started to sprout, but in all a good season. I believe if we are diligent in all we do and stay positive, we will be blessed. I will be the first to admit that it's been a long hard summer. To follow that statement, I will quickly add that if it weren't for our families and good neighbors it wouldn't be possible. Remember to thank your husbands, wives, children and neighbors for all they do as well. A warm meal at the end of the day, or a cold drink brought out to the tractor, or a simple "Hi Dad" at the end of the day goes a long way. Without the help, love and continued support from our families, the days would be more taxing. May the season be bountiful for all of us, and remember to give thanks for a great year. The weather took a dip in temperature just in time for the State Beef Cook-off hosted by the Utah CattleWomen on Saturday, September 13, 2014 with the theme of “Fall Favorites”. Five contestants busily prepared their dishes, and the aroma spread through the air and out the building bidding more people to attend. You can’t beat the sizzle of steak, or the aroma! Attendees were given door prizes from the Utah Beef Council of caps, aprons, t-shirts or flexible cutting boards. Thanks ReNee McKinnon for all of your help. Nicki Wintch, our UCWA State Beef Cook-off chair does an excellent job as MC and organizing for the event! Our Judges this year were, Candice Richardson, Kjirsta Yardley, and Jennifer Hastings. Thank you ladies! 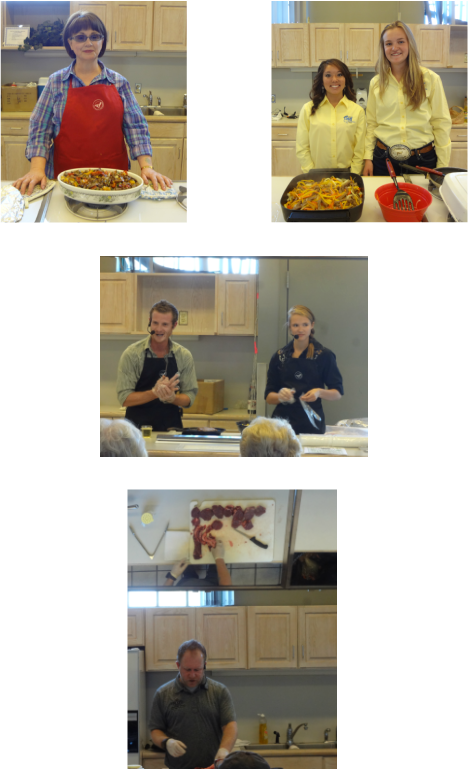 Virginia Bobzin had the winning recipe of “East Meets Tex-Mex Steak Stir Fry”. For all of the recipes and their pictures you can go to our website: www.utahcattlewomen.org and Utah Beef Council’s website: www.utahbeef.org. It was a “Steak-a-licious” Day! Thank you to everyone who made this a success! This is sponsored by the Utah Beef Council and one of the delicious ways they put YOUR money to work in educating the consumers! Remember how important it is to get your comments into the EPA and our elected officials on EPA’s Clean Water Act for the Waters Of the United States! This will affect EVERYONE, not just Agriculture. If you have a puddle spot in your yard - yes they could decide to take jurisdiction over it if they feel like it. It is VERY IMPORTANT TO get EVERYONE you know to send in comments! Happy October and fun harvest times to you all! If I would have known the events that would be opening six years ago as I rushed to the UCWA's breakfast meeting, to be pulled aside and asked to be willing to be a second Vice President, I would gladly do it again! I can't speak for the two that I coerced into being second VP's with me, but to me, what a good ride it has been! Strolling through the pastures of history it has been enjoyable learning about the history of UCWA! What a great legacy of ladies supporting, promoting and educating. Continuing forward with assisting in Farm Field Days, we have tried once again to get Area Directors involved. I think we have emulated our new slogan of “Educating Generations for the Future”. Trotting forward with the UCWA Scholarship and the UCWA State Beef Cook-off, we have been able to reinstate the Utah Beef Ambassador Program (UBAP) after 14 years. I am really excited about this and our winner this year is Leann Fox. She has won the NCBA internship at Washington DC for next summer! We will get to hear from our Utah Beef Ambassador Team at winter convention. Our first UCWA Team Beef team just galloped in their first relay in October. Of 80 teams they placed 25th and were in the top FIVE of the ladies teams. Deb Richards chaired the team with Trina Johnson, Heidi Johnson, Cachelle Ross, Diana Negus, Jodi Reeder and Wendy Jo Jensen. At a nice steady lope we threw in getting our very own Tax ID, our own UCWA membership application, kept up our webpage and a couple of amendments to our UCWA Constitution and By-laws, so we are ready to meet any demand. I have been spoiled with the most amazing people to help everything run smoothly for our organization. My heartfelt Thanks go out to Francine Hallows, ReNee McKinnon, Diane Weston, Jodi Reeder, Julie Weston, Deb Richards, & Wendy Jo Jensen for being the best executive board ever; to Angie Holden, Ginger Johnson, Sherece Munns, Kelli Jackson, Kris Money, Teri Eyer for being Area Directors; and Nicki Wintch for being our UCWA State Beef Cook-off Chair. Thank you to all the amazing ladies on these committees: Audit, Budget, Nominating, Scholarship, Sponsor, UBAP and UCWA Team Beef. The old saying is true that many hands make light work! 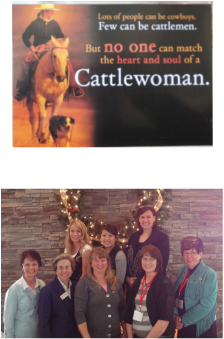 I am so fortunate to associate with the “cream of the crop”, cattlewomen are the best! It has been an honor to represent you! I've met amazing women who work hard alongside their husbands, raising great families and many with second and third jobs. Besides all the hats they wear as a full time "Mom", they are secretaries, cooks for hunters & firefighters, dance instructors, print designers, volunteers for church, piano teachers, landlords, tour guides, business owners, teachers, artists, amazing cooks, web designers, home health nurses, restaurant owners, bank managers and commissioners. Some amazing women forge forward when their partners are taken all too soon from them. My heart goes out to them. I've come to find that this saying is true for our ladies of the Utah CattleWomen! "Lots of people can be Cowboys, Few can be cattlemen. But NO ONE can match the heart and soul of a CattleWoman." If you can ever make it to a national convention,DO IT! You will not regret the chance to see the level of amazing people working hard to fight on the issues in your behalf. As on the state level we have amazing ladies on the national level. I hope you will come to our annual winter convention December 3-5 at the Sheraton in Salt Lake City! For our CattleWomen’s general breakfast meeting we will have Pantry Secrets doing a demonstration, and providing us with a tasty treat! Our ANCW President Elect, Melanie Fowle from CA will be here to help install our new officers. Melanie is an energetic amazing lady you will all be glad you have met! This has been a wonderful opportunity! I feel like you are in good hands as we continue to Educate Generations for the Future! Thanks again for the great ride!